Unfortunately OpenGL ES takes away many of the functions that beginner programmers use. They do this, because a lot of those functions are plain rubbish for any high-end application. The Pandora supports OpenGL ES 1.0 as well as ES 2.0. The main difference with ES 2.0 is the lack of the fixed function pipeline, which has been replaced by freely programmable GLSL shaders. OpenGL ES compared to classic OpenGL leaves you with only a handful of functions, where you have to do all of the matrix math on your own, which can be really hard if you're not good at maths. I'll cover how to do that in a later tutorial. What you're learning here isn't just for the Pandora, you should use these new methods in your Windows/Linux code. These changes are being made to the OpenGL core profile, too, so you're losing all of this stuff soon enough. You know what I just did? Yeah, I drew a triangle! Nope, you can't draw stuff like this in OpenGL ES 1.1, so how would one draw a triangle in ES? Bear with me while you read this if you don't understand it, I'll explain it in depth. This is called drawing with a vertex array. Eww? Yeah, you would never draw like that in a real program, your vertex array would be stored already, you wouldn't have to define it every time you drew somthing. While it's messy for drawing primitives, it's really cool for drawing models, because your models vertices are generally stored in arrays like that already. I'll show you an example from TINCS after I explain this code. This should be obvious, we're simply creating an array that stores the vertices of our triangle. It can be of any size, you can store as many vertices as you want. Note, how I space out every three numbers, this is because a vertex is made of X,Y,Z components. So we have our X, our Y, our Z then a space for the next three. You don't have to space it like this, it's mainly so you can see what's going on. We need to do this before we start drawing, this tells OGL that we're going to feed it a vertex array from the client side (rather than the server, which is the graphics card). Ok, here is where we're telling OGL where to get it's vertices from. The first argument, tells OGL how many components (or floats) there are per vertex. Remember we talked about how we were spacing them out every 3 numbers? Here we're telling OGL that we did that! The next argument tells OpenGL that we're giving it floating point numbers. Now we have a "0". This is called the stride, I could explain it in detail, but you don't need to understand it yet. Just leave it at 0. In the last argument we give OGL our vertex array! Here is where the work is done. The first argument is telling OGL that we're drawing in triangles. (This can be GL_QUADS, GL_LINES, whatever!). The second is specifying where we want to start in the array we passed OGL earier. The last one is telling OpenGL how many vertices we want to draw. In this case, it's just the three. Finally, we're disabling the vertex array state. We're done! So this is one of the ways to draw stuff in OpenGL. It's the next step up from glBegin and glEnd and it works fine in ES 1.1, so it works fine on the Pandora! OpenGL can be great for speeding up your 2D application. One of the ways you do this, is by drawing with OpenGL rather than SDL. 2D games are made up of lots of sprites, which are just images that move about in a 2D world. You can use hardware acceleration to speed this up. If you're only planning on using 3D stuff on the Pandora, read this anyway, it introduces you to texturing with texture arrays and you're probably going to need to use sprites somewhere anyway. So, we can pick apart my method of sprite drawing in TINCS for this tutorial, I mainly use this function to draw text, once it's been rendered by SDL_ttf and converted into a OpenGL texture, but never mind any of that. Give it a good read, make sure you understand all of the stuff we've been over before and how it's applied in this example! Also, I'm not sure how this will fare in the 3D realm, I only use it when I'm in Ortho mode (2D, drawing ma GUI). This is new too, what we've done, is got the texture co-ordinates that we would usually pass to OGL per-vertex. (glTexCoord2f() style) Then put them into a little array. Just like last time, we're enabling a state on the client (not the server), this one tells the GPU we want to pass a texture coordinate array too. Here we're passing the texture coordinates to OGL. Exactly like the vertex coordinates, except that the first argument (the size) is only two. This is because we only need two values per texture coordinate (a U and a V). We disable the texture coordinate array just like we did with the vertex array. An SDL/GLES exemple is also available on the git repository. Sometimes its not best to use the modified version of SDl (when working on cross platform games). Instead you can use EGL to create the GLES graphics context for you. The following functions do just that. Make sure you call InitOpenGL() straight after creating the window (SDL_SetVideoMode()). When using EGL you should not pass in the SDL_OPENGL flag to SDL_SetVideoMode(). SDL_HWSurface and SDL_SWSurface should do. You will notice '#ifdef GLES1' around much of the EGL code. Simply define GLES1 in your preprocessor (-DGLES1 on the command line of gcc if i recall correctly?) to use GLES. Without the define SDL will be set up for standard OpenGL (I left it in as its useful for cross platform dev). Once you have finished with the window and just before terminating it call TerminateOpenGL() to clean up. This is just one way to do it, but it's the simplest I know of. User ptitSeb has released the PND "Code::Blocks", which not only contains the Code::Blocks IDE but an updated gcc compiler, git and many libraries needed for development including a special version of SDL2 for the Pandora. All of which you can also use from the command line on your Pandora. You can read about ptitSeb's SDL2 patch on the forums in this thread: https://pyra-handheld.com/boards/threads/sdl2-pandora-patch.75966/. You can use the following test code to get something running quickly. Note you should use some better shader functions which print out an info log if you made an error in your shader code. Also note that GLES2 fragment shaders require precision qualifiers (lowp, mediump, highp) for floats. I used an #ifdef statement so the shader code works with both OpenGL and OpenGLES 2.
" v_color = vec3(1.0 - 0.5*(va_position.x+va_position.y),va_position);\n"
"	float c = cos(u_time), s = sin(u_time);"
"	vec2 t = mat2(c, s, -s, c)*(va_position-vec2(0.33));\n"
"	gl_Position = vec4(t.x*3.0/5.0, t.y, 0.0, 1.0);\n"
"	gl_FragColor = vec4(v_color, 1.0);\n"
A colored rotating triangle on a blue background should appear. You can quit using the escape key. The exported environment variables are very important. They tell the patched SDL2 library to use the GLES2 driver instead of glshim which only translates OpenGL 1.5 calls. Else your shader code will silently fail with an empty info log. When you finished coding your program and you want to publish a PND on the repo, you also have to package all your linked libraries from your Code::Blocks development environment. Here comes copy_libs.sh in handy, which is also contained in ptitSeb's Code::Blocks PND. Remember, you can and should use this knowledge for regular OpenGL! iPhone Dev Center - contains some general OpenGL ES 2.0 programming information. Typhoon Labs OpenGL ES 1.1? tutorials and shader guides - Windows-centric but potentially useful. Feel free to add any you find here. First, you will need to be able to test and run your programs on your development machine. For this you will need an OpenGL ES emulator and the OpenGL ES SDK. Note that to run the emulator on your machine, you need an OpenGL 2.0 compliant graphics card, any nVidia 6XXX+ or ATi 95XX+ should work. BUT you do not need any special graphics hardware if you only want to compile an application on your PC, and test it on the Pandora. 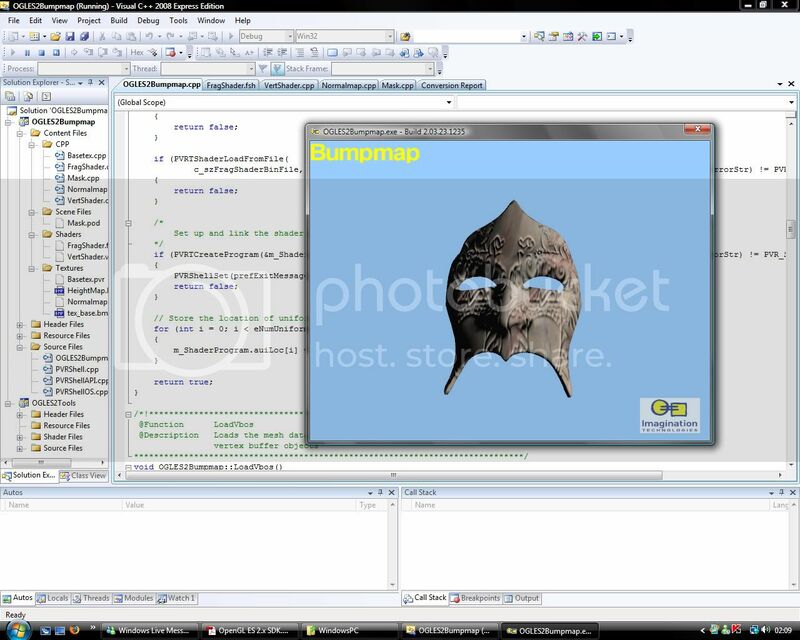 OpenGL ES 2.0 SDK for PC This works both on Linux and Windows. You will need to register with imgtec before downloading. Running an OpenGL ES application on your PC is not as simple as just downloading the SDK, building some demos, and running them. To run the demo applications, you will need to set a few environment variables so that your system can find the necessary libraries. Or, you can add the libraries to your system path as appropriate. If you are not afraid to use the commandline, try "export LD_LIBRARY_PATH=$SDK_PATH/Builds/OGLES2/LinuxPC/Lib" and "export PLATFORM=LinuxPC", where $SDK_PATH is the path of the unpacked SDK, such as "/home/username/OGLES_SDK/". By copying the files in the (SDKPackage\Builds\OGLES2\WindowsPC\Lib) folder (libEGL.dll, libEGLv2.dll, etc) and pasting them in the Windows folder, which is already a default path in VC++. This method is preferred, since all the executables and projects that came with the SDK were programmed to find the DLL's in the folders that are configured by the default VC++ configuration. This page was last edited on 18 September 2016, at 03:27.